There’s so much coming up in Devon to look forward to in the run-up to Christmas. Whether you’re a Devon local or you’re taking a holiday to the West Country this festive season, getting involved in all the exciting Christmas events Devon has to offer is a great way to spend your time. Let’s take a look at three of the most exciting Christmas events that are coming up in the area. The Exeter Christmas market is a must if you are visiting Exeter this winter. Located on Cathedral Green, Exeter Christmas market allows you to escape from the hustle and bustle of chain shops and supermarkets and immerse yourself in a festive wonderland. Try some of the amazing food vans, spend some time in the cosy tent sipping mulled wine and be sure to check out the amazing array of handmade and locally sourced gifts on offer. It’s a great opportunity to pick up some unique presents for your loved ones. Candlelit Dartmouth kicks off on Friday the 30th of November at 4pm, filling Dartmouth with festive fun all the way through to Saturday afternoon. This event features a Christmas market in the town’s Royal Avenue Gardens, a choir performing Christmas carols, as well as musicians and entertainers providing seasonal cheer throughout Dartmouth. Santa will also be in his Grotto on Saturday and a best-dressed Christmas dog contest will be held for those who bring their pooches along. It’s the ideal way to welcome the beginning of December and enjoy Dartmouth. 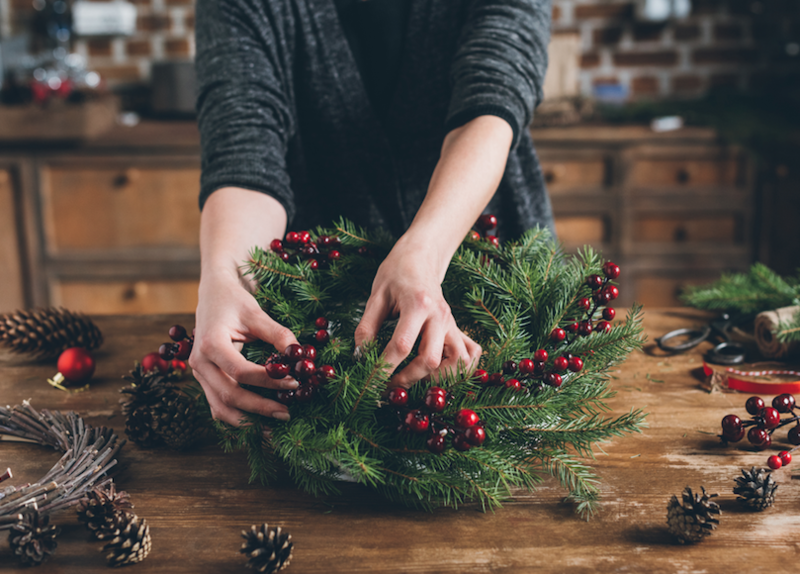 Last but not least, be sure not to miss the Christmas wreath making workshop at Riverford Field Kitchen in Buckfastleigh. Out of all of the Christmas events in Devon, this is one you may not have considered going to but Christmas is the perfect time to get crafty! On the 6th and 7th of December, join head gardener, Penny Hemmings, who will show you how to make your very own festive wreath. Think red berries, sprigs of holly and pine, and beautiful evergreens. Mince pies and coffee will also be on offer and at the end of the workshop, you get to take home your very own Christmas wreath. If you’re spending the holiday season in Devon, we hope you’re just as excited about the upcoming Christmas events in Devon as we are! For more information on things to do in the beautiful West Country, take a look at some of our other blogs, or feel free to get in touch.